Sunglasses have long been the world’s favorite piece of protective eyewear helping to block out radiant rays of light from the sun. 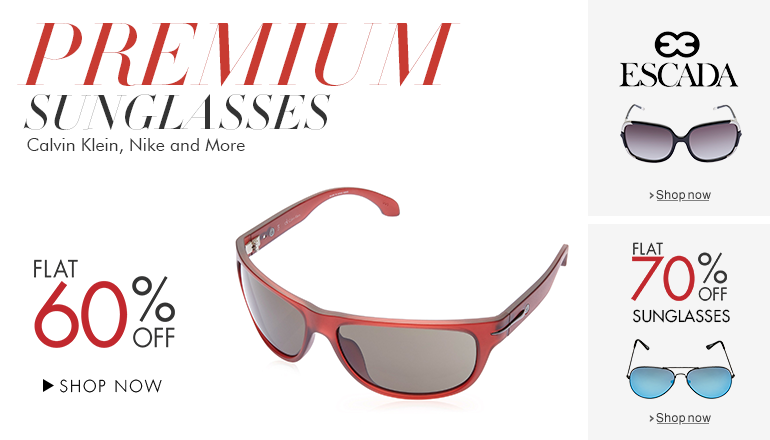 They can prevent sun damage to your eyes, improve your vision and make a unique fashion statement. Apart from comfort, sunglasses have also been known to enhance visual clarity because of their protective function. Sunglasses can also be used to see clearly into water, by eliminating glare that is reflected at some angles off the surface of water. Sunglasses are essential for people exposed to high levels of Ultraviolet (UV) light during activities like snow sports, waters ports and driving in bright weather. Sunglasses protect you from ultraviolet radiation, which has been known to cause a number of conditions. Sunglasses have been considered to be a very hip style statement universally. Different varieties of designer sunglasses make their way into the front of the line in fashion trends every year, posing as essential accessories to complete the summer look. The one thing you should give the most importance to when choosing a pair of sunglasses is how they fit, because that decides how they look on you, as well as how effectively they can block out UV rays. When a pair of sunglasses fits perfectly, it will sit snugly on your face without feeling like it’s too tight. Make sure the frame isn't wide enough to let UV rays in from the sides, and that the centre of the lens lines up exactly with the centre of your eye. While sunglasses are available in many kinds of shapes, there are only few that are well-known to everyone, such as the aviators and wayfarers. Shapes of sunglasses mostly play a role in aesthetic appeal, but can also prove to be important for specific activities. For example, sunglasses used for athletic purposes typically come in the wraparound style, such that the UV rays are blocked from your face from every angle. Ultraviolet protection should be given the number one priority when looking to buy sunglasses. A pair of sunglasses that offer hundred percent UV protection along with polarized and anti-reflective lenses are ideal for reducing glare to protect your eyes. The lenses and frames of most sunglasses are made of plastic, but the type of plastic used can make a whole lot of difference in your sunglasses. Choose a pair made of stronger plastics, as these don’t shatter easily, preventing injury to your eyes. An ideal pick is polycarbonate in the lenses as well as frames because it is lightweight and durable. Additionally, high-grade shatter-resistant plastic CR-39 must be used for the lenses. Tints are incorporated into sunglasses to offer different ways to filter the light around you. For a reduction of brightness that does not cause color distortion which can be harmful for driving, you can go in for lenses that are grey-tinted. For a complete blockage of the overhead sunlight without excessive darkening of your view, you can go in for gradient lenses, which fade to a lighter tint from a darker top. If you’re heading to the beach, your best bet would be amber and brown lenses, which are great for reducing glare and blue light. The TwistLock Technology keeps your headphones secured with a simple twist. Once in place, the earbuds are 'Locked' into place and won't wrangle free even during the most strenous of exercises. The ear buds are designed with heavy workouts & intensive exercise in mind and therefore sweat and moisture won't hold you back from your goals, and it should not affect your headphones. It is designed to allow more ambient noise than most other earphones at the same volume levels. This keeps you safe and aware of your surrounding while still committing 100% to your workout. It's ergonomically designed to avoid nerve rich areas of the ear. It is made with flexible silicone, yurbuds are ultra-soft and comfortable for hours on end.